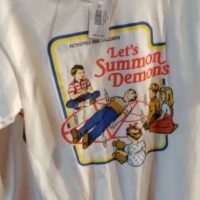 (Heather Clark – Christian News Network) A video posted to social media informing Christians that mall retailer Spencer Gifts sells t-shirts bearing messages such as “Let’s Summon Demons” and “Let’s Sacrifice Toby” has gone viral. Marcus Rogers, an active Christian and aspiring pastor in the Chicago area, recently recorded live inside of a shopping mall in Illinois after deciding to investigate a post he saw online. He provided footage as proof that the store offers shirts that glorify Satanism and the occult.